" You can find Niittykahvila Cafe of the Silent People on the shoulder of the road by an old hayfield where the clothes of the peat-headed figures flap in the wind and where the wafting aromas of fire-brewed coffee invite you in. " Niittykahvila Cafe of the Silent People offers an unforgettable experience for all motorists driving along Highway 5. If you need a cup of coffee between Suomussalmi and Kuusamo, this is the place to visit! Come and taste our proper fire-brewed, kettle coffee and delicious butter-baked Finnish crepes. We can cater for groups at short notice and serve lunch with a little more notice (2 weeks). Our cafe seats 50 visitors throughout the year and there are an additional 90 seats outside during summertime. 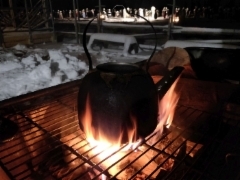 In addition to Finnish crepes, the cafe offers salty snacks, refreshments, ice cream, northern delicacies, local products, nice souvenirs and lunch for groups. Embrace of Mother nature Lunch Buffet is available every day from 26th of June until 11th of August from am 12 to 4 pm. Herbs from meadow around the cottage, other local ingredienses and freshly baked organic bread garantees the pure symphony of tastes. Pleace make a reservation in advance if you have a group more than 10 person. Meadow Cottage provides service to groups all year round! Niittykahvila Cafe can now provide service to travellers with a wider range of needs and in any weather thanks to our new Meadow Cottage. The Silent People gets new clothes twice a year, summer clothes and winter clothes. Come and join us summer clothes dressing volontary workers at 6th of June 2019..
To groups all year round !